Dr. Wyatt Case is never happier than when he’s walking the halls of his history museum. Playing wingman for his best friend at Gravedigger’s Tavern throws him way out of his comfort zone, but not as much as the eccentric man behind the bar, Ash Lucroix. Ash is everything Wyatt doesn’t understand: exuberant, quirky, and elbow deep in a Gaslight lifestyle that weaves history into everyday life. He coordinates his suspenders with his tongue rings. Within hours, Wyatt and Ash are hooked. 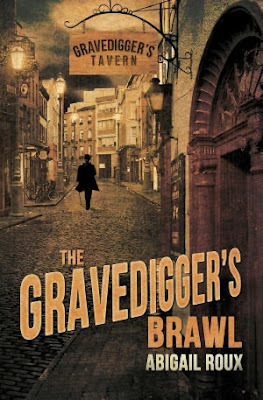 But strange things are afoot at Gravedigger’s, and after a knock to the head, Ash starts seeing things that can’t be explained by old appliances or faulty wiring. Soon everyone at Gravedigger’s is wondering if they’re seeing ghosts, or just going crazy. The answer to that question could end more than just Wyatt and Ash’s fragile relationship—it might also end their lives. Okay, I'll admit it...I definitely judge books by their covers and this is a book I avoided (although I know and love this author's writing) just because of that cover. It looks too much like a historical and then I read the description and it's about a history museum curator, which meant I immediately pushed it aside. I don't read historical. Well, after hearing several good reviews, I finally broke down and picked up this book. I am so glad I did, because I WRONGLY judged this book by its cover. It's a GOOD book and extremely contemporary! Not only is this book a romance (actually there are a couple of romantic story lines within this one), but it's also a really awesome, creepy ghost story. I made the mistake of reading it after everyone went to bed and will admit to getting a bit spooked. I've read several ghost stories over the last few weeks, but none were quite as spooky as this one managed to be. I'm not normally a person who goes for scary, but this one was so good...it worked for me. Wyatt is a museum curator who is stressed at work and on the verge of losing his job because foot traffic is down while they are renovating part of the museum (big "duh"...he warned the Board that would happen). Nick also works at the museum and is his best friend. He drags Wyatt down to Gravedigger's Tavern to distract him and to introduce him to Ash. Nick has his own fascination going with the bar owner, Caleb. But there are strange things happening at Gravedigger's. There's always been rumors about ghost-sightings there, but all of a sudden everything is starting to ramp up...just in time for Halloween. This book had just the perfect amount of creepy and romance. I really liked Wyatt and Ash. Wyatt is your typical history geek...kind of awkward, kind of shy. Whereas, Ash is a bartender...a really, really good-looking one. That leaves Wyatt off-kilter and he's the one to throw the first wrench into their relationship which hurts Ash. I liked the way that was all written...it just seemed really honest and right on the way so many relationships work. Ash puts himself out there with Wyatt and then Wyatt blows it...not because he likes Ash, but because he likes him too much and is freaking out. Add in some super-creepy ghosts threatening Ash and this was just the perfect mix of emotion, angst, and suspense. LOVED it!! Thanks for the giveaway! Hope you have a wonderful day! Thanks for the giveaway and Thanks and God Bless to all the men and women who serve. A big thank you to all participants of this blog, supporting such a great cause.